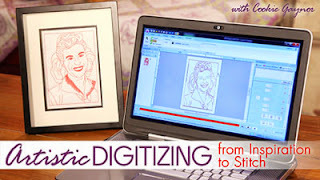 This post is dedicated to the students who have asked about Stitch Artist 1 and 2 in my Craftsy digitizing classes. Create a quick design for the"Trick or Treat "kid inside of you. Word Art is simple and can be done with almost every home embroidery software package in a short amount of time. Key tips: vary the size, direction and font styles. Choose colors that will stand out from background. 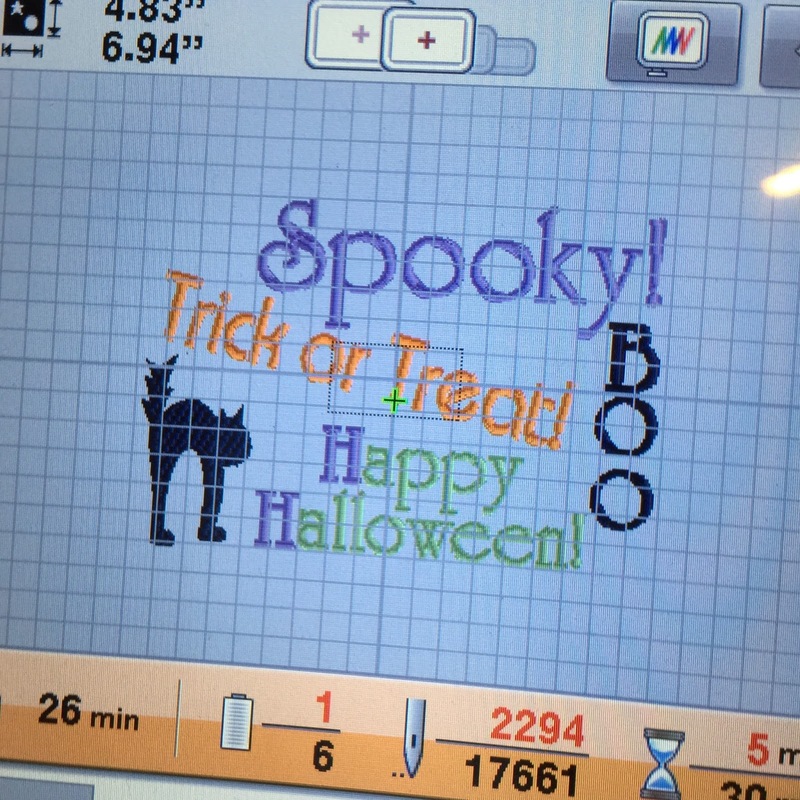 If this design were stitched on a black sweatshirt, then the Boo and cat would be changed from black to perhaps glow in the dark white thread. Embrilliance is affordable, easy to use and gets the job done. Not everyone spends their dollars on expensive features in software that they might not use. I want all the bells and whistles but that is part of my digitizing illness. There is a lot to be said for pay as you go. 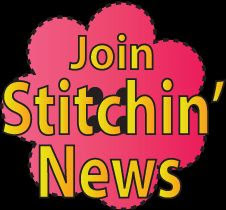 I tend to buy as much sewing machine as I can afford and the same for software, knowing I can grow into it! Embrilliance software can be used by both Mac and Windows users. That caught my immediate attention. I am able to put the software on both of my computers which is incredible. I can seamlessly use both platforms in the same manner and therefore no transitional learning curve required! In this photo, you can see how crisp the letters are with a nice raised underlay which is set to the default. 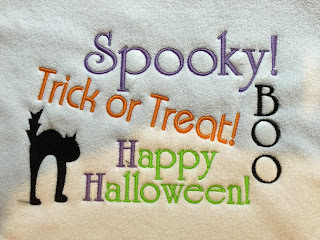 Impressive clean stitching by choosing the stitching style, the color, and letter style. 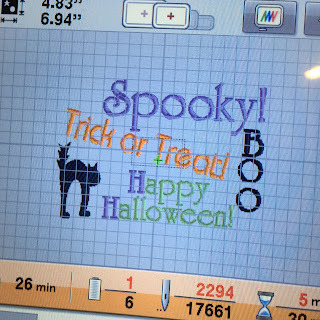 The Spooky Word Art design file is on Facebook as a free download for a limited time so you can see it stitch out for yourself! It shows what Embrilliance can do fresh out of the box without any "insider understanding" of setting. Beginners do not have all the tricks of the trade when they first start creating designs! I could make the stitch out even better with entrance and exit point options and angle directions. There are 12 letter choices in the basic platform with Embrilliance. The prior post on the Yoga Pillow shows some of the other letter styles included. More lettering is available. In a matter of minutes, the design was typed into the screen, colors and styles were selected, easily resized and rotated and the cat shape added. True we can use most of our softwares for this but I have a Mac, and the convenience and price point made it a no brainer for me. 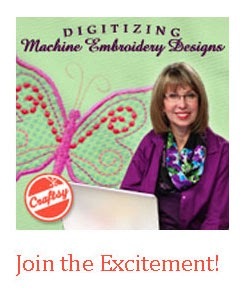 Plus it helps me answer questions for students in my digitizing classes on Craftsy. I love the Embrilliance slogan: "Welcome to Embrilliance, embroidery for the rest of us!" Thanks for sharing this great guide! There's a lot of programs out there that can really help create some unique designs. 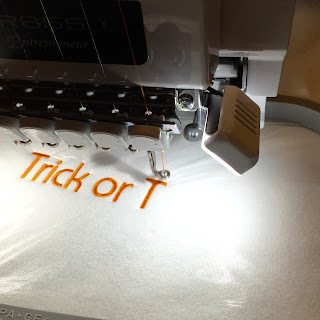 I like your little Halloween project here!